Florida’s list of non-native bugs causing problems continues to grow, including one nicknamed the “super termite,” also known as the Formosan subterranean termite. So far the termite hasn’t hit St. Johns County, but it has arrived in Putnam and Duval counties. “They were first discovered (in the U.S.) in South Florida near Hallandale and then they were discovered in the Panhandle around Fort Walton. From there they’ve just moved in,” said Bruce McCowan, an entomologist with Florida Pest Control in Gainesville. The Hallandale discovery was made in 1980. University of Florida researchers estimate the termites were actually there five to 10 years earlier. The Formosan termite has been found in areas around the state in Ocala in Marion County and Leon County and well as Putnam and Duval counties. The good news about the termite is that “they don’t seem to travel very well. It’s unfortunate if you’ve got them. It’s fortunate they don’t spread very well,” McCowan said. The Formosan subterranean termite is actually a native of Southern China that was transported to Formosa, Taiwan, where it picked up its name. From there it went to Japan prior to the 1600s. It has slowly spread since, with the first colonies in the U.S. found in the 1960s in Texas, Louisiana and South Carolina. The South is likely to remain the major target of the Formosan termites since they prefer warmer climates and their eggs don’t hatch at temperatures below 68 degrees. McCowan said the Formosan termite is “very similar in habits” to native subterranean termites that plague Florida. While their appetites are about the same what’s different is the size of the termite colonies. A subterranean colony can have up to 500,000 termites. The Formosa termite colony can have several million termites. “There’s that many more mouths in the same amount of space. They really do damage, it’s just the sheer number that do the damage,” he said. “It’s something you don’t want to try yourself. As professionals we do have the ability to control them for you,” he said. Tenting is rarely needed, he said, noting that’s for dry wood termites, a different breed. Soil treatments are the most common means for controlling the Formosa termites. “The peculiar thing about Formosa termites is that once they get above ground, if they find moisture from a roof leak or a leaking pipe, they can survive even a soil treatment,” said McCowan. * Resemble the native subterranean species. * Found in structures including boats and high-rise condominiums. * Most aggressive and destructive timber pests in the U.S.
* Also attack non-cellulose materials including plaster and asphalt looking for food and moisture. * As of 2010, found in Alabama, California (an isolated infestation in San Diego County), Florida, Georgia, Hawaii, Louisiana, Mississippi, North and South Carolina, Tennessee and Texas. Our “do it yourself” pest, termite, and lawn care center offers a wide variety of professional products to consumers. In our Melbourne self service retail store, we offer professional grade pest control and lawn care products. Our trained employee will help you determine the best products available and instruct you on how to effectively use our products. Be sure to check out the picture below from inside our store and visit www.alhoffer.com for more information. (NewsUSA) – For many Americans, colder weather means seasonal decorations and holiday baking -; but if you’re one of those who set out gourds and holly or cookies for Santa, you might be opening your home to some unwanted guests. The holiday season may also bring out pantry pests, which make themselves at home in pantry foods like flour, cereal, dry pasta, spices, nuts and dried fruit, as well as in decorations made from dried flowers and potpourri. The most common pantry pests are beetles, ants, weevils and Indian meal moths. * Store seasonal decorations in airtight containers. Items like dried foliage, potpourri and Indian corn should be carefully stored in the off-season. Keep them in a dry environment, such as a closet or office, and unpack them outside. * Inspect fresh decorations before you bring them indoors. Look over wreaths, Christmas trees and garlands to make sure you’re not bringing insects into your home. * Store food properly. All food should be stored in plastic or glass containers with sealed lids. Keep cabinets, pantries and countertops clean and free of crumbs. * Examine pantry items before you use them. Check packages before you bring them home from the store. Never buy any item that appears damaged. Throw out expired ingredients. If you have any ingredients that haven’t been used in the past year, inspect them before use. 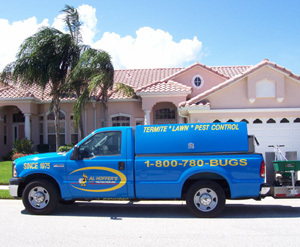 If you do find pests, contact a pest professional. They will know the best way to treat an infestation. For more information on preventing pests from crashing your home this holiday season or to find a licensed pest professional, visit www.pestworld.org. The November newsletter is out! Take a look at the November newsletter by clicking here. These tips from the BBB are a great resource to use when deciding to choose a lawn care company. Everybody — well almost everybody — loves a green lawn. But keeping it neat and tidy, weed free and green is another story. Green lawns take work and not everyone enjoys time behind the mower or the fertilizer spreader. To the rescue is a plethora of lawn-care services ranging from the kid down the block to national lawn-care companies. And if you’ve noticed that the number of lawn- care services is growing as fast as, well, your grass, there’s good reason. According to the Professional Landcare Network (PLANET), more than 30 million acres of turf cover the United States and homeowners spend more than $11.6 billion planting and maintaining it. In addition to being the perfect medium for bare feet and somersaults, turf contributes to the environment in a positive way. A well-maintained, 50-foot-by-50-foot lawn produces enough oxygen for a family of four. PLANET notes that eight healthy front lawns have the cooling effect of 70 tons of air conditioning, enough to cool 16 average homes. Dense, healthy grass also slows down and filters runoff, removing contaminants and trapping soil. If you’re one of the growing number of people opting out of yard work but who wants to keep your landscape in tip-top condition, your BBB suggests that you choose a lawn service in the same manner as any other service professional. First, decide what services you need and get estimates from several lawn-care companies so you can compare apples to apples. Are you looking for a perfectly manicured and green lawn? Then you may need a company whose services include pest control, dethatching, reseeding and core aeration as well as fertilizing and lawn cutting. Don’t know who to call? Ask neighbors, friends and family for referrals and then check them out with the BBB. Is the company a member of a professional lawn-care association? Is it licensed to apply lawn chemicals? This is important because application of any chemicals other than fertilizer requires a license from the Colorado Department of Agriculture. Then ask the company representative to visit your home and provide you with an evaluation of your lawn and written estimate of recommended services. Does the company individualize its services? Or is it one lawn fits all? Ask the lawn service if you have a choice in products used on your lawn. Can you get a lawn program that offers reduced use of fertilizers and pesticides? And of course, you’ll want to ask about price. Most companies base their prices on a property’s total square footage of the turf area. Some providers may offer an annual contract, seasonal contract or be available on an on-call basis. What happens if you have an issue that arises between scheduled visits? Be sure to ask. Make sure you have a written contract from the lawn care company you hire. It should clearly state the services you will receive as well as how you will pay for it. Have a trusted friend or relative read over the contract if you’re unsure. And lastly, make sure that your concept of a well-maintained, green yard is also your lawn-care companies. Remember to call AL Hoffer’s for all of your lawn care questions, needs, and services! Check out some of these great industry links and other useful information on pest & termite control. The Adams Pest Control blog recently featured a post on available positions in the company. This Arizona Bee, Bird, Pest & Termite Control Company has a cool blog they update daily. ﻿﻿http://pestcemetery.com/ has some very useful information for both consumers and business’s alike. All American Pest Control has a blog where they keep you up to date with the buzz around Nashville. Bulwark Exterminating also has an interesting blog with lots of great information.